External hard disks of higher storage capacity is a necessity more than a convenience for people dealing with large data and files as it frees them from multiple smaller capacity storage devices. Similarly, these large capacity hard disks also free up valuable space on your laptop or desktop that will result in significantly improved system performance. With these factors in mind, we bring you the best five 2TB portable hard disks available in India that are curated according to various features such as build quality, data speed, transfer rate and other miscellaneous add-ons. With this said, let’s dive straight into the article and choose the best for your use! However, extra care should be taken while handling this product as a minor slip from the hand might result in a broken glass or at the worst a broken device itself. Sony HD B2 is a portable hard disk with 2TB of storage space with support for the latest USB 3.1 technology. The Sony HD B2 has a 2TB storage capacity with superspeed USB 3.1 technology powering the data transfer. The Sony HD B2 uses NTFS protocol for data storage, NTFS has several advantages over the FAT32 protocol such as faster access speeds and easy file recoverability. If you are in search of a budget portable hard disk capable of high-speed data transfers, the Sony HD B2 is an excellent choice. Seagate has been making hard drives from those times when the 90’s kids were starting to know about assembling computers. Since then the company became one of the most respected and sought-after brand in the hard disk market in India. The Seagate backup plus slim is a 2TB external hard disk that has a small and compact form factor which makes it one of the lightest hard disks to carry around in your pocket or backpack. The Seagate Backup Plus Slim has a minimal non-textured chassis that is made of tough and durable plastic. The only thing that adorns the outer shell is the Seagate logo. A white LED is tucked on the shell that lights up when you connect the hard disk to a computer or any other device. This device is only 12.1mm thick, so you can easily carry it around your pocket with no hassles. Weighing only 141g, this is one of the lightest hard disks available in the market. This external hard disk features a USB 3.0 port for high-speed data transfers. Do note that only if you connect it with a USB 3.0 port, you can enjoy those higher speeds. Backward compatible with USB 2.0, you can also use this product with old USB 2.0 devices that don’t feature a USB 3.0 port. There is no need for any software or drivers to be installed for using this device. Just plug it into the USB port and start copying files. That’s it! The 2TB storage lets you save your favourite moments and other sensitive documents. The 128-bit AES encryption with password protection will make sure that your data remains confident and free from spying eyes. The two-month free Adobe Creative Cloud subscription lets you store your photos in its full glory to the cloud and keep this hard disk free of space to save more. The Seagate Backup Plus Slim is the best external hard disk for you if you’re a frequent traveller and love to carry a lot of media with you for enjoyment during the trips. This hard disk also lets you store your favourite moments captured from your digital camera and smartphone. The 2TB storage will ensure that you won’t run out of space anytime soon. Priced just under Rs.6,000, this device, we feel is the top contender for the best value for money external hard disk in the market. Toshiba Canvio lineup has some excellent storage devices in their lineup ranging from traditional hard disks to internal SSD. The Canvio Advance 2 is a portable hard disk with 2TB of storage capacity priced competitively under a budget of just Rs.5,300. The Toshiba Canvio Advance 2 follows a minimalistic design with a plain plastic body construction and the company logo embossed on the surface. The rounded corners of this external hard drive are very appealing to the eyes. There is a status LED on the top part indicating the mode of operation. This LED will automatically turn off when not in active use. The Toshiba Canvio Advance 2 weighs about 149g which is one among the lightest portable hard disks out there in the Indian market. The Toshiba Canvio Advance 2 comes with a 2TB storage out of which nearly 1.8TB is available for users to save and store their files. This external hard disk follows the USB3.0 standard for high-speed data transfer between the source and host device. It is backwards compatible with the legacy USB2.0 ports albeit having significant speed drops when compared with a USB 3.0 port. The Toshiba Canvio Advance is a plug and play device that doesn’t require any drivers to install for you to use this hard disk. The 5400 RPM motor inside this hard disk is relatively silent and works well even while using it in transit, for eg: while inside a vehicle on a bumpy road. This portable hard disk is compatible out of the box with Windows, Linux and MacOS machines, thanks to the integrated NTFS drivers which come preinstalled with the device. The Toshiba Canvio Advance 2 is an excellent budget 2TB portable hard drive that offers very good read and write speeds, especially when used with compatible devices through USB3.0. The elegant design and the sleek form factor makes it one of the best looking portable storage mediums available in the market. This product comes with a three-year limited warranty that will cover unforeseen issues with the device such as any hardware failure resulting on its own. 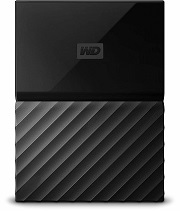 That concludes our discussion on the five best 2TB external hard drives available in the Indian market. We have tried our best to list the ones that we personally feel is a great value for your hard earned money. If you feel that we have left something out, do let us know in the comments below. Thanks for your time, and hey, do consider subscribing to our weekly newsletter for more exciting gadget picks and buying lists.